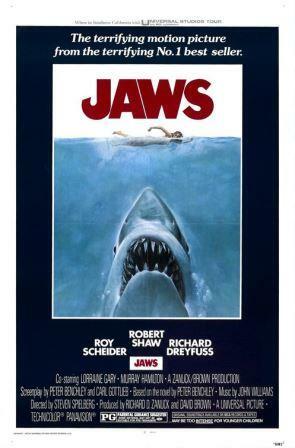 Tomorrow (Saturday) is the 40th anniversary of the movie, “Jaws.” On June 20, 1975, the scary shark movie debuted in theaters. Normally, I laugh at the silly marking the anniversaries of movies and other pop culture (unless it’s an exceptional, important movie, like “Death Wish”). Pop culture isn’t history and shouldn’t be elevated to it. That said, last year, I heard this very funny (and non-political) interview, below, with star Richard Dreyfuss’ (of whom I’m NOT a fan) uber-lefty kids, Ben and Emily Dreyfuss, regarding the movie and what people say to them. Even though it was on tax-funded NPR (National Palestinian Radio), it’s worth a listen . . . Yes, I am aware that Dreyfuss is a loathsome figure, and I can’t stand the guy. He is a far-left, self-hating, anti-Israel Jew (and a strong candidate for lunch in Tul Karem). Just like Leonard Nimoy, he was a strong supporter of the anti-Israel group, American Friends of Peace Now, which supports the anti-Semitic boycott of Israel. And he’s openly said he’s proud of voicing his baseless criticism of Israel (and of playing anti-Semitic caricatures of Jews). His kids’ politics are similar. His son, for example, works for Marxist “Mother Jones.” Still, the interview isn’t political, and I found it funny. By the way, the much cooler guy in “Jaws” is the late Roy Scheider. Its a telling commentary on our time that born Jews are anti-Israel and people whom halakah doesn’t view as Jewish turn out to love Israel! As the interview shows, being Jewish by accident of birth doesn’t make one feel Jewish where it truly counts! It says a lot about the state of Jewish education in American life. Getting a bigger boat won’t fix it. I was thinking of why Richard Dreyfuss who is Jewish, didn’t win the Genesis Prize, which went to Michael Douglas – who isn’t a Jew, yet he was in Israel this week. So his paternal ancestors were Jewish? So were mine. And I know where I stand on Israel. If you don’t consider Michael Douglas Jewish, then Ben and Emily Dreyfuss aren’t Jewish either. Their mother is non-Jewish actress Jeramie Rain. Agree w/ you except when you say Michael Douglas isn’t Jewish. Actually, Michael Douglas is in fact definitely Jewish. He calls himself Jewish, and his father is Kirk Douglas, who of course is definitely Jewish. Michael Douglas’ children are taking an interest in Judaism. I suppose better late than never. Assimilation is a tragedy and Orthodox Judaism can’t afford to write off young people just because their mother isn’t Jewish. If we ignore them, they will become easy prey for the radical Left/Islam. Not good. Ha-ha! I’ve never, ever have seen “Jaws”…I love movies but some very popular movies I have just never seen…like “Rocky”, “ET” and “Close Encounters Of The 3rd Kind”. Have no desire to, either. And while we’re on this topic, let me just put it out there IF Steven Spielberg will ever be accused of being a paedo. He sure loooooooved to work w/kids. I’m just waiting and waiting for it to come to light, if applicable. My personal belief is YES, he rolled that way. The JINOs sure make it hard for we Christians who voraciously support Israel. They are the annoying gnat to the dung-beetle also known as Islam or Moooooooslims. We have a hard enough time trying to deal with the dirty and Satanic Moooooooslims, the last thing we need are fools who should be on our side (but are NOT!) getting in the way and mucking up the mire. JINOs are beyond annoying! To Tommy: no mention of Robert Shaw’s politics in his lengthy Wiki bio. To: “skunky’: You “love movies”but have never seen Jaws or Rocky? That’s like saying you love art but have no use for The Louvre. Ralph, that was fantastic. Thanks. The topic of “who is a jew?” always leads to only one answer. Intermarriage is destroying the Jewish people. You can debate this topic until the end of time. Eventually there will only be a few thousand Jews left in America because of all this assimilation. The debate will reach a natural end on its own simply because there will be no one left except for orthodox or observant Jews. Unaffiliated, reformed , or even conservative Jews are intermarrying at alarming rates. Can anyone argue the consequences of this fact? Jaws came out when I was 14 years old. I lived in West Palm Beach at the time. My sister and I went to the matinee at noon to see Jaws. When we got out of the theater, our stepfather picked us up and took us directly to the beach! Yikes! What a great sense of humor he had! 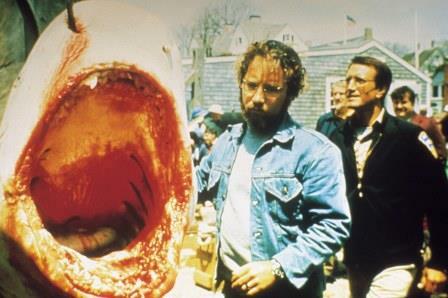 For what it’s worth, if you read the book, “Jaws”, you’ll note that the Richard Dreyfuss character does indeed get eaten by the shark. It was changed in the movie version where he survives. Jaws was one of the great movies of all time. I only watch the last hour when they go out in Robert Shaw’s boat. Agree about Scheider – also great in “Marathon Man”. Robert Shaw stole the movie – died just a few years later, sadly. Agree that Roy Scheider was a fantastic actor. I think is best and most powerful performance is as Bob Fosse in “All That Jazz,” director by Fosse himself. You totally forget that you are watching an actor at work and for the duration of the film, Roy Scheider IS Bob Fosse. Robert Shaw was another great actor who made you completely forget you a watching an actor and he transformed completely. Shaw died way too young. So many of today’s actors — Ben Affleck, Will Smith, Angelina Jolie, and Gwyneth Paltrow come to mind — aren’t true actors the way Scheider or Shaw were, using my particular standard. They are NOT the people they are playing and you never quite forget that fact, no matter how good the script they’re doing is. Well, it would be amusing to see Richard get shot by an Islamic terrorist, true. It is amazing how many American Jews are LEMMINGS. Did you hear the one about the nearsighted Rabbi who mistakenly went to see “Jaws”? He thought it was “Jews”.